When it comes to hair, I’m convinced that most women go through a phase (at least once in their life) of wanting hair different from what we were born with naturally. Science pretty much offers our hair stylists what they need to allow us to have the color hair that we want, but they’re still working on fool proof ways to get the texture we want. Those of us with curly hair have most likely longed to have straight hair, and those with straight hair would love to have some extra body. This topic of conversation was mentioned just last week in my ladies book club, so I know it’s still something that women ponder. For myself, I’ve gone through multiple phases of wanting my curly locks to be straight. It took about 35 years, but I finally learned to embrace my curls. Most of that time was due to not finding the right products to tame the frizz that often comes along with curly hair. Another factor in deciding to embrace my curls is that I wanted those extra 30+ minutes a day back that I was spending fretting over my hair with the straightening iron. 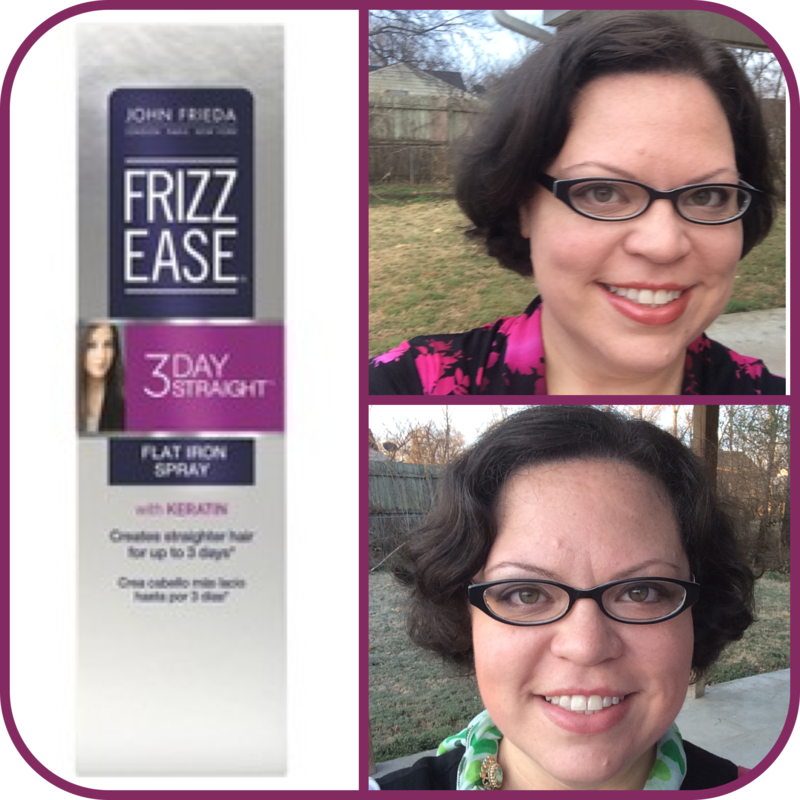 Earlier this year when my styling product of choice was getting more difficult to find, I discovered a John Frieda Frizz Ease crème to help calm my curls, and it worked great at keeping the frizz away. I could have curls without the frizz! We are a match made in heaven. 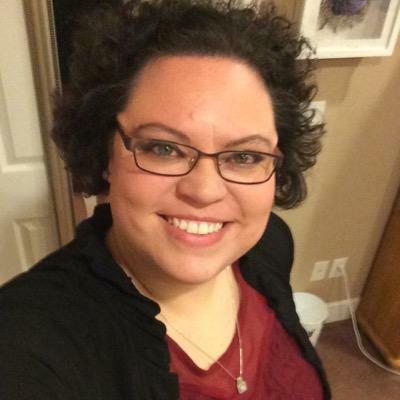 Much to my surprise, just a few weeks after my new product discovery, Influenster included a bottle of John Frieda Frizz Ease 3-Day Straight Flat Iron Spray in the J’Adore VoxBox that I received. Oh – they want me to go back to straightening my hair right after I have accepted my curly mop? Alright, I’ll give it a try. Using the product was easy and very UNmessy, which is pretty awesome. You just spray it on and comb through your hair to spread it evenly. There’s no gunk in your hands to wash off or stick to the sink. This was a win for me, because as much as I like the John Frieda crème I’ve been using, I still hate having to use my hands to apply the product. When it came to blow drying my hair, even though I had applied the spray, it didn’t take extra tie to dry my hair. That’s probably because you’re not expected to drench your hair with the spray. This was another win for me, because who wants to spend all that time blow drying your hair, especially when the weather warms up, and it’s 90 degrees before 8am? I did still have to flat iron my hair. It didn’t magically make my hair straight just by drying it, though it DOES have Flat Iron in the name of the product, so it’s not like I felt duped. However, I can still dream, right? I actually don’t use a FLAT iron when straightening my hair, because I do like for the ends to curl up or under, so I use a large barrel curling iron to get the job done. The results were satisfying. My hair didn’t exactly stay straight for 3 days. The waves were already returning by the end of the first day, and obvious on the second and third day. The photo above has Day 1 on the top right and Day 2 on the bottom right. Day 3 pretty much looked like Day 2, so I didn’t take another photo – plus Day 3 was a hair washing day. Even though my hair didn’t stay straight for 3 days, I can happily say that the frizz was kept at bay. I was able to brush my hair throughout Day 1 and onto Day 2 without the frizzies coming back. This was a major win for me! I’ve since gone back to using my crème (John Frieda Frizz Ease Unwind Curls Calming Crème, to be exact) on a regular basis, but I know that on those rare occasions when I want more straight hair, I have the 3-Day Straight Flat Iron Spray that will get the job done.